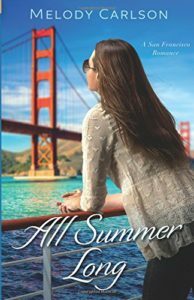 All Summer Long by Melody Carlson is a contemporary romance and book number two in the San Francisco Romance series. It can be read as a stand-alone. I always love Melody Carlson’s novels. I must confess that this is my first book of hers that has not been a Christmas novel and I loved it. All Summer Long is a wonderful gentle romance. It is also a book about friendship. Sometimes being a friend means sacrificing your needs and desires in order to maintain your friendship. Closely linked to the friendship theme is that of family. Family means support. Sometimes it is travelling many miles to be there in a time of need. The novel is also about transformation. Neither Tia nor Natalie were popular girls at Summer camp ten years ago. Now they are both transformed. There are two types of transformation – inner and outer – I shall let you read All Summer Long to find out who is transformed and how. Looking good on the outside is okay but being good on the inside is of vital importance. Some people look perfect on the outside but are like rotten apples on the inside. Others are pearls of great price as their inner beauty just radiates outwards. Melody Carlson shows the importance of being truthful. A little lie can easily become a big lie. Being truthful about all things is best. Likewise keeping secrets can be harmful. Secrets can be a burden. It is far better to be open and honest. Surprises can be great but not if the surprise is just a way of controlling others but just wrapped up in a nice parcel. Melody Carlson has drawn some wonderful characters who are both believable and likeable. Their interactions and exchanges were delightful. The storyline was engrossing. All Summer Long is a fabulous, light hearted, feel good novel. It’s a perfect read, not just for Summer, but all year round. Melody Carlson has an engaging style that draws the reader into the story. For a perfect read I can highly recommend All Summer Long.